XM655 is an Avro Vulcan B Mk2, and the youngest Vulcan in existence (the third to last produced; XM656 and XM657 have both been scrapped). Delivered to 9 squadron at RAF Cottesmore in November 1964, she tranferred to the Waddington Wing in January 1968. She then served with 101 and 44 squadrons, and was with 50 squadron when she was put up for disposal in late 1983. She was bought by businessman Roy Jacobsen who had hopes to fly her on the airshow circuit. She was the first Vulcan “civilianised” and was flown in to Wellesbourne Mountford about a week after a Cat 3 Check, on the 11th of February 1984. Hundreds of people were there to watch her arrive. She had flown only 5,744 hours, making her a very viable proposition for taking to the air once more. However, the Civil Aviation Authority made it clear that the aircraft would not be flying again without stringent conditions being satisfied. While efforts at funding the work necessary were begun and the aircraft was put on the civil register as G-VULC, little real progress was made. A plan to fly the aircraft in America got as far as registering the aircraft on the American civil register as N655AV but no further. After two years Roy Jacobsen lost interest in XM655 and bought another Vulcan (XL426) which was delivered to Southend. Parking fees were mounting at Wellesbourne and after a number of years the airfield owners took Jacobsen to court to recover them. The result was that the ownership of the aircraft passed to Wellesbourne Airfield. XM655 had stood without attention for so long that she was in quite poor condition. Ten years of neglect had finally put paid to any lingering hopes of her ever flying again. At one stage she had been broken into, the cockpit instrumentation vandalised and the co-pilot’s control column removed with a hacksaw. The wingtip panels were also damaged at some point. With the transfer of ownership however, the future began looking brighter. The Delta Engineering Association was formed to look after XM655 and they made it clear from the outset that their intention was to get her into ground running condition only. The aircraft was gradually brought back to life – all the hydraulics were overhauled, the damage to the cockpit was repaired and a number of engine runs undertaken. Delta moved from Wellesbourne to Kemble in March 1996, and after the brief and unhappy existence and demise of the XM655 Association, the volunteers remaining at Wellesbourne decided that the best way forward would be a properly constituted membership organisation to look after XM655. As a result the 655 Maintenance and Preservation Society (655MaPS) was formed in late 1998. Thanks to the generosity of Wellesbourne Airfield and with funds provided by the society’s members and other donors, 655MaPS have been able to assemble an impressive collection of workshops, storage units and ground equipment to support and service XM655. The rear spar has been inspected and found to be in excellent condition. XM655 now has fuel in her tanks at all times to keep the system and the seals ‘wet’. All the aircraft systems are powered up and exercised regularly. The aircraft has been repainted several times to keep the inevitable corrosion of the more than 50 year old structure under control, the flying control surfaces (elevons and rudder) have been reskinned, the jet pipe end caps have been replaced and the three engines with the longest running hours have been removed, opened, inspected and re-installed. Engine ground runs (EGRs) are carried out approximately every three months, together with slow taxi runs to ensure the steering and braking systems are functional. Once each year, usually in June, XM655 takes part in Wellesbourne Wings and Wheels, which is our major public event of the year. Reports of past events can be found on the Taxi Runs page, and details of the next event are on the Events page. 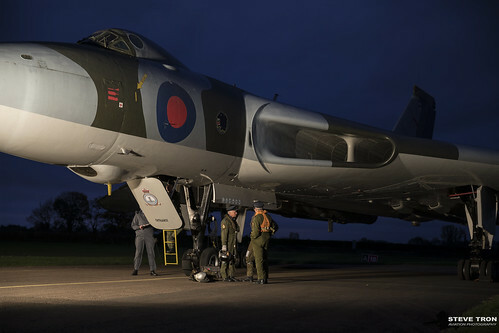 XM655 is virtually complete in terms of installed equipment, with the H2S Radar, the Terrain Following Radar (TFR) and Identification Friend or Foe (IFF) systems all still in-place, as well as the complete suite of Electronic Counter Measures (ECM) equipment. The only notable item missing when XM655 left RAF service was the in-flight refuelling probe; not surprising considering the world-wide hunt for serviceable probes which had occurred during the Falklands conflict a couple of years earlier. Eventually, a replacement probe was obtained and installed, and XM655 regained her familiar profile.